Seljalandsfoss is famous in Iceland because you can actually go behind the waterfall curtain! 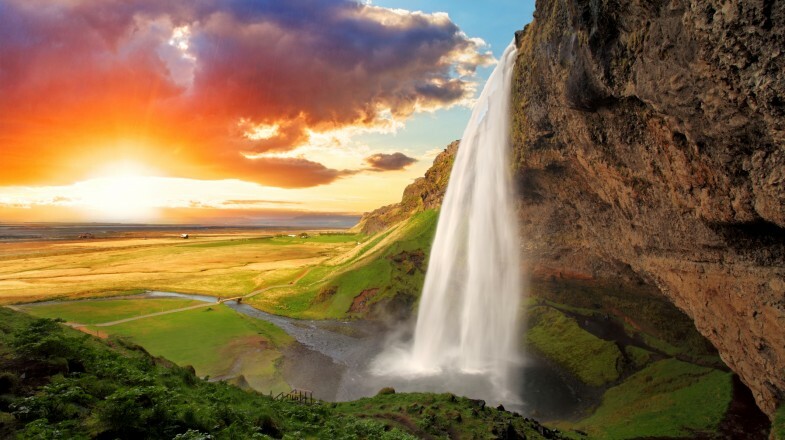 A key highlight of Iceland’s southern coast, Seljalandsfoss waterfall, with its stunning cascading falls from a steep cliff, is perhaps one of the most well-known waterfalls in Iceland. Standing at an impressive 65 meters tall, Seljalandsfoss is fed from the waters of the glacier-topped Eyjafjallajokull volcano and completely captivates all those who make the trip to see it. No trip to the south of Iceland is complete without a visit to this jaw-dropping work of nature, particularly if you are already taking in the sites of the South Coast route. Seljalandsfoss along with Skogafoss is one of the two main highlights of the famous Golden Circle in Iceland. In this article we cover all the highlights of a visit to Seljalandsfoss, how to get there, and the best way to spend your time. With powerful waters that flow into a sweeping meadow sprinkled with wildflowers, the entire area surrounding Seljalandsfoss is absolutely stunning, particularly in the summer months. On a sunny day, you might even see a rainbow appear in the waterfall’s mist. One of the most incredible things about visiting Seljalandsfoss waterfall is that, unlike other waterfalls, you can actually see it from behind. The site has a wooden staircase and path that you can follow into a small cave behind the falls, providing the perfect photo opportunity. But be careful – the steps can become slippery because of spray from the falls. Visit early in the morning for the best views, before crowds of visitors show up. As one of Iceland’s most popular waterfalls, Seljalandsfoss can get quite busy. This is especially true during the summer, particularly July and August when the weather is warmer and there are more tourists in Iceland. However, the site is big enough that even the biggest crowds can’t spoil the view. While the crowds might be smaller in winter, bear in mind that the path to walk behind the falls will be closed during the winter months as it becomes too slippery and dangerous due to possible falling ice. 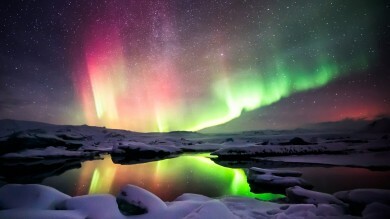 Instead, opt to visit during late spring or early autumn. You might be surprised to find a slight lack of tourist infrastructure at the Seljalandsfoss site. There were plans to build a large information centre; however, opposers argued it would spoil the view and interrupt the area’s natural look. Be sure to wear your rain gear on your visit to Seljalandsfoss, and bring extra layers if visiting during the colder months! You will get a bit wet if you stand near the falls, particularly if you take the path behind them. It is also a good idea to wear a pair of shoes with good grip (especially when wet) to prevent slipping. Seljalandsfoss was featured in the sixth season of the popular TV show The Amazing Race, and can also be seen in Justin Bieber's music video for his song I’ll Show You. We’ve put together this itinerary for those who might be travelling by car to Seljalandsfoss from Reykjavik. 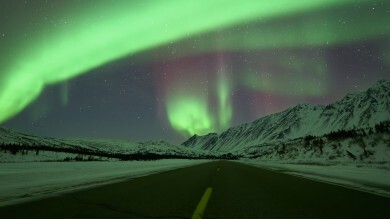 Leaving Reykjavik, drive east along Road 1. After about 20 minutes of driving (about 25 km), make a detour just off road 1 to visit the Geothermal Energy Exhibition at the Hellisheiðarvirkjun power plant. The exhibition opens at 8 am on weekdays and 9 am on weekends, and is a great place to visit if you want to learn about how Iceland is the only country in the world where 100% of its electricity comes from renewable sources. Drive another 25 minutes (about 30 km) and you will reach the town of Selfoss. Stop here for a peaceful walk along the banks of the Ölfusá river, or for a dip in the town’s outdoor swimming pool and hot tubs. You are now just under an hour away from Seljalandsfoss. Continue driving along road 1 until you come across signs for the waterfall. How long you spend here completely depends on you. Drop in for a 15-minute stopover before continuing down the coast, or take your time and soak in the atmosphere of this powerful waterfall. After visiting Seljalandsfoss, you can turn back for the two-hour journey to Reykjavik or you can continue along road 1 to see more sights. Just 25 minutes (30 km) from Seljalandsfoss waterfall is Skogafoss, another popular Icelandic waterfall that is well worth a visit. On your way, you will pass Eyjafjallajökull volcano that famously erupted in 2010, causing major travel disruption across Europe. Continue on for another half an hour (33 km) to visit Vik, the southernmost village in Iceland, and it’s incredible black sand beach before heading back towards Reykjavik. The return journey will take you just over two hours. Be sure to stop by in one of the coastal villages for a feast of delicious seafood on your way! There is so much to see on the south coast of Iceland – we are only just scratching the surface here! 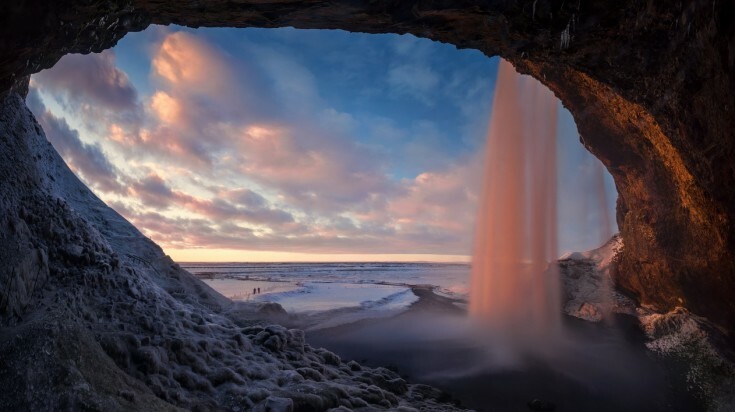 Be sure to check out our other guides, including our itinerary for Skogafoss waterfall, for more information on the area’s incredible sights. Seljalandsfoss waterfall is only about 120 km from Reykjavik, making it easy to visit in a single day if driving. In fact, because of its sheer size, you will be able to see Seljalandsfoss from the ring road long before you actually reach it! This is even true during the winter months, as the falls are lit up for the winter. 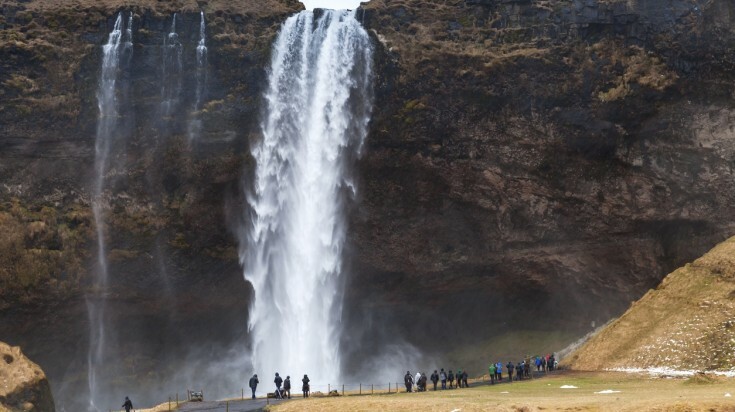 If you are not renting a car in Iceland, most tour operators include a visit to Seljalandsfoss as part of their South Coast one-day adventures. An evening as seen from behind Seljalandsfoss. Don't you wish you were here?